"I hope I'll find shelter there for the night," he said to himself. When he reached the door, he saw it was open, but though he shouted, nobody came to greet him. Plucking up courage, he went inside, still calling out to attract attention. On a table in the main hall, a splendid dinner lay already served. The merchant lingered, still shouting for the owner of the castle. But no one came, and so the starving merchant sat down to a hearty meal. Overcome by curiosity, he ventured upstairs, where the corridor led into magnificent rooms and halls. A fire crackled in the first room and a soft bed looked very inviting. It was now late, and the merchant could not resist. He lay down on the bed and fell fast asleep. When he woke next morning, an unknown hand had placed a mug of steaming coffee and some fruit by his bedside. The merchant had breakfast and after tidying himself up, went downstairs to thank his generous host. But, as on the evening before, there was nobody in sight. Shaking his head in wonder at the strangeness of it all, he went towards the garden where he had left his horse, tethered to a tree. "Ungrateful man! I gave you shelter, you ate at my table and slept in my own bed, but now all the thanks I get is the theft of my favorite flowers! I shall put you to death for this slight!" Trembling with fear, the merchant fell on his knees before the Beast. "Forgive me! Forgive me! Don't kill me! I'll do anything you say! The rose wasn't for me, it was for my daughter Beauty. I promised to bring her back a rose from my journey!" The Beast dropped the paw it had clamped on the unhappy merchant. In the beginning, Beauty was frightened of the Beast, and shuddered at the sight of it. Then she found that, in spite of the monster's awful head, her horror of it was gradually fading as time went by. She had one of the finest rooms in the Castle, and sat for hours, embroidering in front of the fire. And the Beast would sit, for hours on end, only a short distance away, silently gazing at her. Then it started to say a few kind words, till in the end, Beauty was amazed to discover that she was actually enjoying its conversation. The days passed, and Beauty and the Beast became good friends. "I quite understand! And I'm not offended by your refusal!" Life went on as usual, and nothing further was said. One day, the Beast presented Beauty with a magnificent magic mirror. When Beauty peeped into it, she could see her family, far away. "My father is gravely ill and close to dying! Oh, how I wish I could see him again, before it's too late!" But the Beast only shook its head. "No! You will never leave this castle!" And off it stalked in a rage. However, a little later, it returned and spoke solemnly to the girl. "If you swear that you will return here in seven days time, I'll let you go and visit your father!" Beauty threw herself at the Beast's feet in delight. "I swear! I swear I will! How kind you are! You've made a loving daughter so happy!" In reality, the merchant had fallen ill from a broken heart at knowing his daughter was being kept prisoner. When he embraced her again, he was soon on the road to recovery. 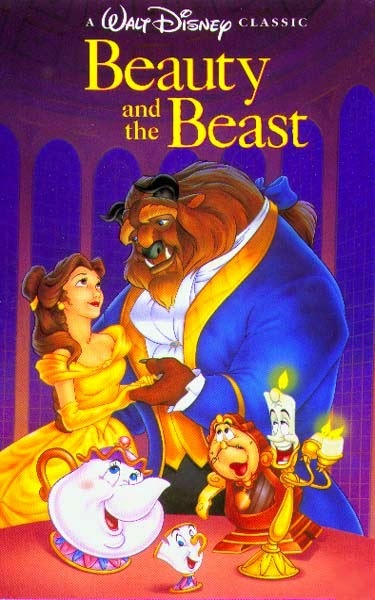 Beauty stayed beside him for hours on end, describing her life at the Castle, and explaining that the Beast was really good and kind. The days flashed past, and at last the merchant was able to leave his bed. He was completely well again. Beauty was happy at last. However, she had failed to notice that seven days had gone by. Then one night she woke from a terrible nightmare. She had dreamt that the Beast was dying and calling for her, twisting in agony. "Come back! Come back to me!" it was pleading. The solemn promise she had made drove her to leave home immediately. "Hurry! Hurry, good horse!" she said, whipping her steed onwards towards the castle, afraid that she might arrive too late. She rushed up the stairs, calling, but there was no reply. Her heart in her mouth, Beauty ran into the garden and there crouched the Beast, its eyes shut, as though dead. Beauty threw herself at it and hugged it tightly. "Don't die! Don't die! I'll marry you . . ." At these words, a miracle took place. The Beast's ugly snout turned magically into the face of a handsome young man. "How I've been longing for this moment!" he said. "I was suffering in silence, and couldn't tell my frightful secret. An evil witch turned me into a monster and only the love of a maiden willing to accept me as I was, could transform me back into my real self. My dearest! I'll be so happy if you'll marry me." The wedding took place shortly after and, from that day on, the young Prince would have nothing but roses in his gardens. And that's why, to this day, the castle is known as the Castle of the Rose.